What if because of physical or mental limitations, determined by your DNA, you were told what you could achieve. While this is done now to a lesser degree, the world depicted in Andrew Nicool’s Gattaca is not far away. In his writing and directorial debut Andrew Niccol has created a superb sci-fi movie of the not so distant future. 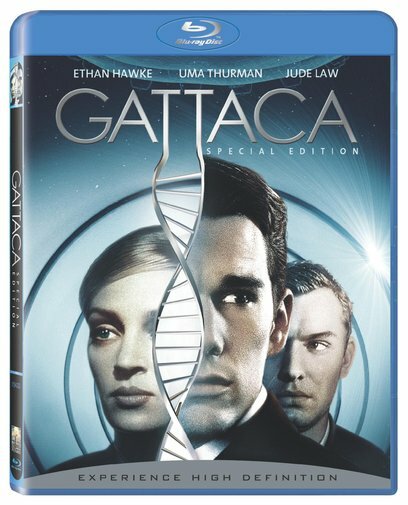 In Gattaca Vincent Freeman (Ethan Hawke) is a faith birth. Which means he was born as nature intended, with no genetic intervention. As a result, he suffers from myopia and a congenital heart defect. These defects are never a good thing, but in the society Vincent lives in where social classes are determined by ones DNA these defects are detrimental. The best Vincent can hope for is a job in janitorial services. Vincent is what is known as an in-valid. Seeking to became a valid Vincent calls on the underground world to buy an identity and is paired with Jerome. The deal is that Jerome with supply blood and urine samples in order for Vincent to pass the genetic test and in return Vincent will provide a lively hood for Jerome. With this Vincent can accomplish his dream and enters the space program. He is easily accepted in the space program and the only criteria was his new found DNA. As Jerome he starts a relationship with fellow cadet Irene Cassini (Uma Thurman) who find Vincent’s genetic profile impressive. However, a week before Vincent’s schedule trip to Saturn's moon Titan, the mission director is murdered and Vincent’s DNA is found, igniting a thorough investigate of everyone. The greatest thing about Gattaca is that the world depicted is not far away from ours. It is easy to see that we are heading in this direction. Take for example the testing that a lot of elementary school children receive these days. The exam establishes which classroom they will be seated in: the smart class or the dumb class labeling the child forever. Only those determined to break out of the label like Vincent can manage to accomplish their dreams. Man is more than the sum of his parts and cannot be easily quantified. The message Vincent Freeman tries to convey is this: In this world it doesn’t matter what you are or what you have; you can achieved anything if you really want it. Jude Law while not having as much screen time gives the best performance of his career. I saw this movie back in 1997 and it was refreshing to see Jude Law without all the hype and tabloid muck. Ethan Hawke, while not as good a Jude Law, gives a good performance. Uma Thurman was good, but not great. The set design is impressive and it’s no wonder that art director Jan Roelfs and set decorator Nancy Nye were nominated for an Oscar in the category of Best Art Direction-Set Decoration, but lost out to Titanic. The picture in Blu-ray looks spectacular. It is amazing to see that with the proper equipment it is now possible to get the theatrical experience at home. The colors used in the movie are beautiful and the look of the movie is a real delight. The audio is just as great. This translation blows the standard DVD edition out of the water. The Blu-ray disk includes the original featurtte and a new featurette where the producers and the stars of the movie reunite to discuss the movie 10 years later. It also includes a 15 minutes documentary on the field of genetic engineering. The documentary is very interesting and a must see for anyone wanting to know more about genetic engineering. The disk also includes six deleted scenes. Overall this is a disk worth purchasing even if you own the standard edition. Deleted Scenes - Six deleted scenes. The most profound is Coda featuring a list of people that may have never been born had genetic engineering alteration been discovered early. The list includes Abraham Lincoln, Alberto Einstein and Stephen Hawkins.